Part 2: How Can We Challenge ‘Truth’ Today? For Part 1 of the blog, please click here: Are We Really in a Post-Truth World? Do we need to give up on the idea of truth, or revealing it, since the ‘rules’ appear to have so drastically changed? I would like to attempt to answer this question under the rubric of poststructural theory. I believe we have to constantly rethink our strategies in order to challenge those in power, because complex environments require well thought out approaches. I’m not convinced that those undertaken in the 60s and 70s will work today, whether they are activist in nature, or operate on analysing the textual instead, such as discourse analysis or deconstruction. I don’t mean that they have no value, I mean that if all bets are off in terms of the value attached to what truth is (and we are not just talking about what truth is or not here, but also the recognition that truth has less purchase and to some is completely irrelevant), then maybe we should not look at what is being said, but look at something much more fundamental to that, who we are and what our place is in the world. I propose to do this by using Gilles Deleuze’s theory of The Fold (1993). Deleuze uses Leibniz’s theory on the Baroque (the folded subject) to help explain the position of the individual: the subject is perspectival, it is its point of view and represents a particular moment. Deleuze explains how the Baroque differentiates two forms of folding: material and soul that exist on the two levels of Baroque architecture - matter on the lower, and soul on the upper - where each floor is labyrinthine, extending to infinity (2006: 3). 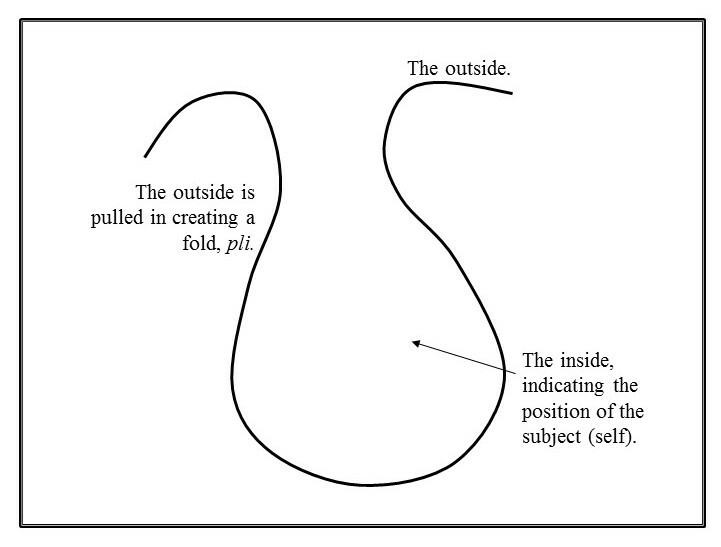 However, these two floors are connected, and Deleuze suggests this connection is formed by another fold (2006: 4), thus there exists a means of communication. On the surface of a fold there is the means whereby a point can develop producing a singularity (when discussing Leibniz, Deleuze uses ‘singularity’ to describe the perception of movement). This is a point of inflection (the place on the curve where the tangent crosses it), what Deleuze describes as an “elastic point” (2006:15). These inflections are potentially innumerable and become available perspectival positions. 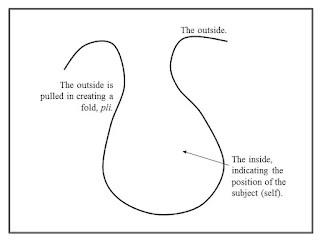 This folding, created by inflection, creates an “envelope of inherence” and Deleuze explains that this inclusiveness simultaneously creates the fold at the moment the fold forms this inherence (2006: 24). Thus, we have the process of aggregation in the folding: the folding creating the force of inclusion, but at the same time this incorporation is forming a fold around that which has been gathered up. Deleuze explains what this means for the soul described by Leibniz (what occurs on the upper floor): this windowless floor, covered with drapery, is inclusive to the point where the process of enveloping is so encompassing that a soul is formed (ibid.). This is not a place, exactly, nor entirely a point of view, but “what occupies point of view, …a soul, a subject” (ibid.). In this process of inclusion, which concurrently forms the fold, it becomes apparent how an inside can be formed from an outside: the windowless floor, defining the soul for Leibniz, creates an intact subject, a soul attached to a body (matter). So what does this model provide us with in terms of explicating the problem of post-truth? We can now begin to see how our sense of self-hood, which appears to be inside us, actually comes from the outside and is formed in a little pocket we conveniently call our ‘self’. The normally polarised inside and outside become connected in the model of the fold, therefore contradictory terms become reconcilable: truth/lie, us/them, and so on. The outside, therefore, is found on the inside, the other is in myself, and the answer to the unthinkable paradox of what truth is, is in thought itself. This has multiple benefits in regard to our problem at hand. The fold, whilst forming an envelope which situates the subject at that point of view, in its act of folding over also enables that subject to see itself. The subject can be self-reflective (and reflexive), can see its place in the world and has agency in terms of moving their perspective (by simply moving along the fold). Also, it means that what may present itself as impossibility (for example, a paradox such as how can the truth be a lie), is not separate from the understandable, but actually contained in it, and formed as a fold of it…. 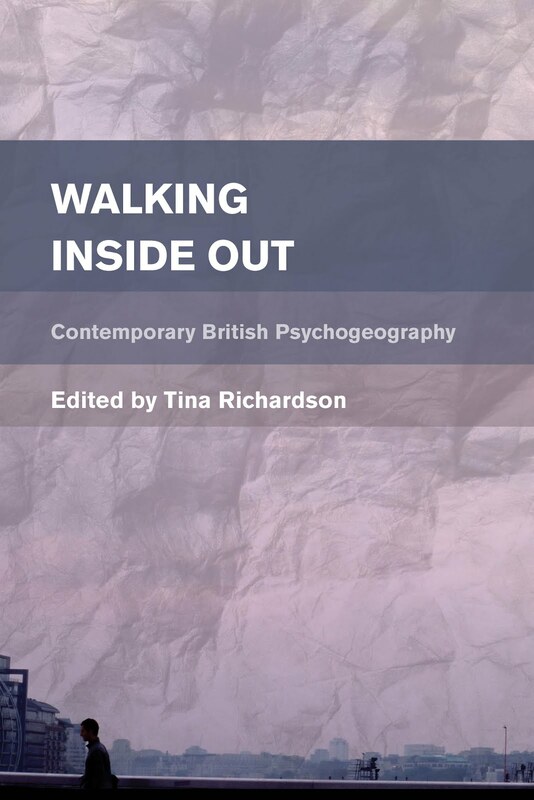 Please note: I have been invited to give a joint talk at the Fourth World Congress of Psychogeography in September 2017 with David Bollinger. While Dr Bollinger and I have had some academic differences in the past, and some not-so-academic differences, we are attempting to get past these in order to present a lecture at this year’s congress. Deleuze, Gilles. 2006. The Fold. Trans. by Tom Conley (London and New York: Continuum).